1、Moisturizes and refreshes the air, filling your space with soothing fragrance, this Aromatherapy essential oil diffuser helps you to lift your mood and relieve your stress, improving the quality of your life. 2、Perfect for home, office, car, or travel, baby bedroom,yoga studio, gym, patio or hotel etc. 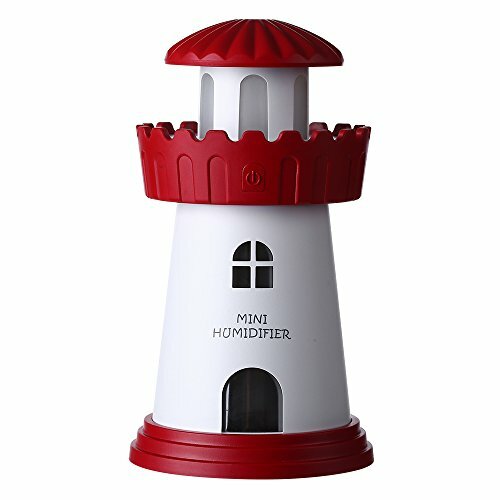 3、Portable USB Humidifier:Novelty Lighthouse Humidifier is powered by USB 5V,any of your device with USB port could make it start to spray, such as power bank,laptop,USB power outlet and in car USB power outlet. 4、Can eliminate the dust, moisturize and refresh the air,Low noise design, good for work or sleep. 5、Lighthouse design and LED Night Light create calm atmosphere, with soft color changing LED light,all tired and trouble feelings are erased.